Northbrook, IL, July 27, 2017 – Digital Check Corp. has published a new white paper explaining the reasons behind the resurgence of the paper check after the Federal Reserve Bank released its most recent Payments Study last December. 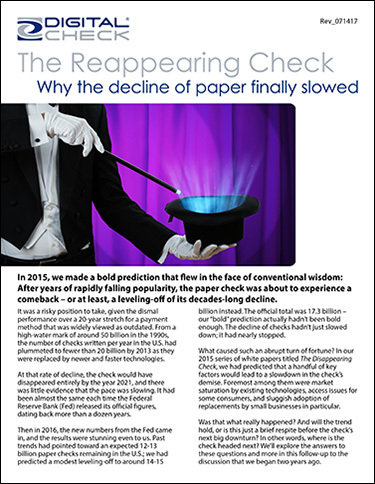 The paper, titled The Reappearing Check, is a follow-up to the company’s 2015 white paper series, The Disappearing Check, which correctly predicted the decline of checks would flatten out after decades of steady erosion. Also discussed are upcoming threats to the check’s continued existence and likely timetables for their arrival. In 2015, Digital Check boldly projected the number of checks written in the United States – which was expected to drop to 12-13 billion, if previous trends had held – would begin to stabilize instead at a slightly higher number. The figures from the 2016 Federal Reserve Payments Study placed the number of checks at 17.3 billion, a slowdown of almost two-thirds from their previous rate of decline. – Resistance to setup costs or percentage fees for other check replacements, particularly among small businesses. The Reappearing Check also examines evolving technologies and their possible effect on the check – including P2P payment platforms, such as the banking industry’s new Zelle app, and Electronically Created Items (ECIs), sometimes referred to as truly “digital” checks. The new white paper is available on Digital Check’s website at www.digitalcheck.com/whitepapers.